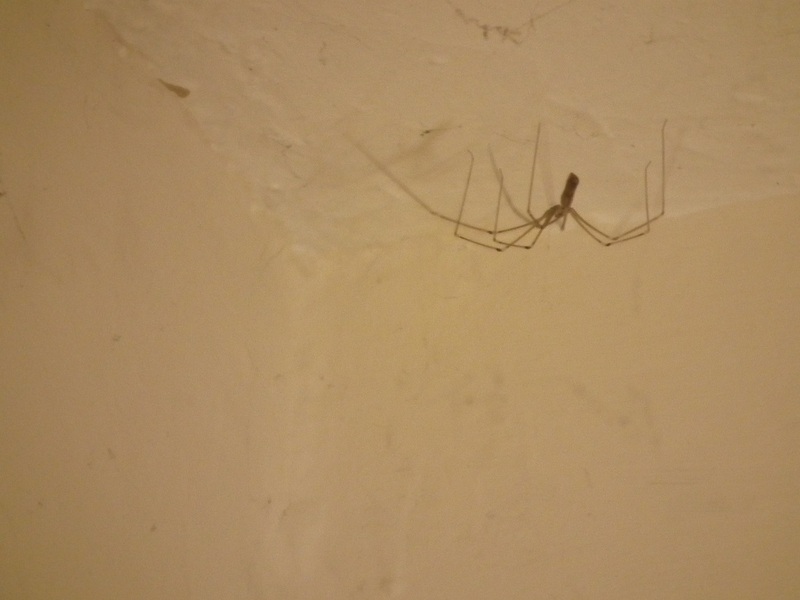 I don’t like to anthropomorphise these spindly wall-crawlers, and I know their lives have different social patterns to our own, yet I still can’t help myself feel a little heartbroken every time I walk past the landing at the top of the stairs. Looking back to September 24th, and you can see the lovely couple that once was. For the last week to ten days the photo above is the only sight in that corner. I don’t know where the other one went, but it did. Now all’s left are the decaying strands of web and memories of flies gone by. The one who’s left doesn’t move much from the corner. Too sad, too soon. Makes me wonder, wonder why life’s such a heartbreaker. Scaryness: 2. It’s the same semi-scary large thing from before, but now I’ve projected my humanity all over it (easy now) I’m just feeling sorry. If I could, I’d bring it down from the ceiling and give a huge hug. But I’d crush it, and that wouldn’t be very helpful. If it were the same size as me I’d give it a hug. Or run away screaming. Yes, actually, I’d probably run away screaming.